The editors at Y! today announced award winning hit artiste, producer and label boss, Davido (real name David Adeleke) as the first ever editor-at-large for its cool new brand, Teen Y! "The choice was simple really," said Tinsel actor Ifeanyi Dike Jr, who is supervising editor for Teen Y! "Who is the all-time, anywhere-in-the-continent coolest teen symbol? It's the guy famous as'Omo Baba Olowo'. There's no one in the market as successful, as hardworking, as iconic. Added Daphne Akatugba, who is contribution editor: "Teenage trendsetters everywhere know Teen Y! as the only hotspot for fashion, lifestyle and all the stuff that matters. Davido mirrors that X factor perfectly. We are excited to work with him over the next three months, and beyond." The announcement was made this afternoon at the corporate office of the Teen Y! parent company, RED in Lagos, Nigeria where it was also confirmed that he will be the brand ambassador for two quarters and will have a column on teen.ynaija.com. 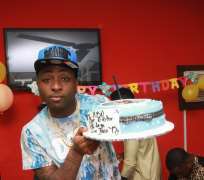 Present were the crew from Davido's record label, HKN as well as the editors at Teen Y!, and its sister company Y! The editor-at-large works with the Teen Y! team on each edition of the magazine and online; ensuring it is aligned to trends, the culture and the ideas that matter for teenagers in Nigeria, and across the continent. He also leads its brand ambassadors - including student editors and school club presidents - and holds the position for a maximum period of six months, renewable at end of term. The artiste who started singing at age 11 and set up his own record label, HKN was in company of label mates B red, Shina Rambo, Danagog and manager Kamal Ajiboye. Launched formally in January 2013, Teen Y! launched its cool new website teen.ynaija.com on October 1. It's first magazine edition will hit the streets with a downloadable online edition on 10 December, 2013. Red Media Africa is a PR & Communication firm under the parent company, RED. An innovative media company focused on Africa, RED's vision is to excite and empower an evolving generation through the media's limitless possibilities. Built across tools and platforms, its Communication Division holds Red Media, Red Marketing and Red Media-SMESupport; and its Content Division holds the Y! brands, including Y! TV, Y! TV, Y! Magazine, YNaija.com, Teen Y!, TeenYNaija.com, Y! 2015, YNaija2015.com and the Y! Annual Black Ball/Y! 100Most Influential List. It also anchors a development firm, The Future Project Africa, which presents Africa's leading youth platform, The Future Awards Africa, and other projects including the Nigeria Symposium for Young & Emerging Leaders and The Future Enterprise Support Scheme.